The more wine I taste and study, the more complicated and confused I’m getting. New discoveries have destroyed some of my previous knowledge about wine completely. Passion fruit, for instance, is the aroma I associated with NZ Sauvignon Blanc, which I like, but according to wine chemistry, it is one of flaws in wine, and so is the nutty aroma. Recently I’ve been obsessing with chemistry of wine, and some of the questions I had about “sulfite reduction and aromas” caused by the lack of oxygen have been answered through extensive reading and listening. Wine is becoming science at the moment, but I can’t wait to get back to tasting it as fantastic and delicious alchemical grape juice and just enjoying it. The biggest confusion came in a series of tasting events in the last week including Salon de Vignerons Independants, where I detected all kinds of aromas that I had only heard of but hadn’t smelt before. Some wines had very unmistakable off-odors such as cat’s pee, burnt match and cooked cabbage beyond the acceptable level. I will go over the photos and notes from the event some time in the future, however, right now I have to deal with organising information, photos, contacts, etc. as my stay in Bordeaux comes to the end in 2 weeks. Plus, this week I’m going on a week-long road trip to the Burgundy and the Rhone all the way from Bordeaux, which I’m so excited about! For now, let me continue on from the previous post about the gastronomic dinner, we started with Château Mirebeau, Pessac Léognan, 2002. Chateau Mirebeau has gone biodynamic since 2005 and I’m curious about their cuvée de la lune 2008, which is supposed to be blended or bottled in full moon – need checking. Anyway, Mirebeau 2002 was closed on the nose, only hinting a bouquet of cassis and violet but the body was still there, though unstable, lacking the mid-palate, so the overall impression of the wine was that unfortunately it overpassed its prime time. 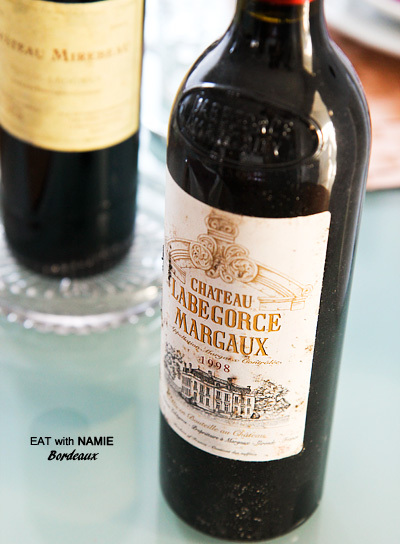 In the middle of the main course, Château Labegorce, Margaux, 1998 was opened and we got to compare the two. Both still deep ruby in colour, but the differences in the character were so clear. 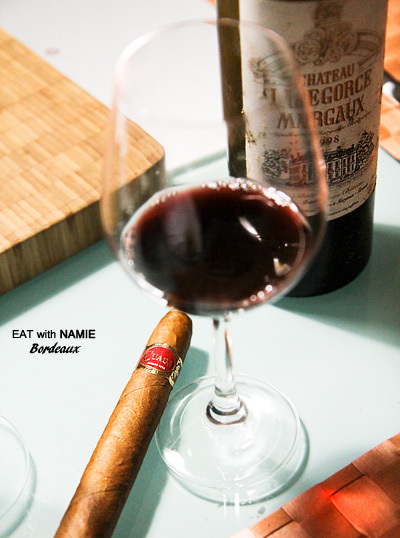 Labegorce (right), which has more Cabernet Sauvignon than the other, exhibited more of fruity, tobacco and vegetal flavours with a full-mouth feel to begin with. the woody and grassy aromas hit me, and for the first time in my history of drinking wine, not only did I detect “green bell pepper” in wine, but also “cigar”. The experience was so amazing that it felt as if a piece of meat stuck in the teeth suddenly came out. 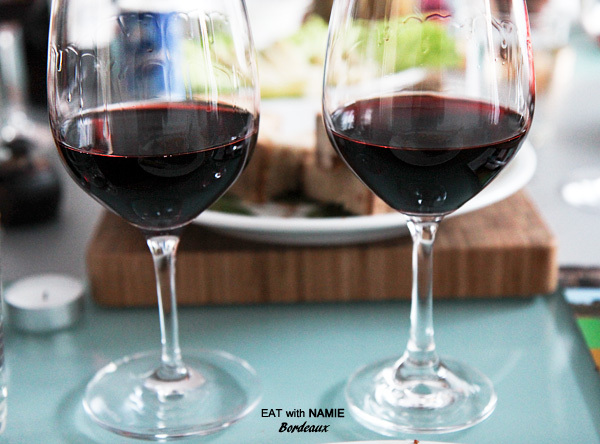 I’ve heard so many times in wine tasting courses and reviews that Cabernet Sauvignon has a smell of bell pepper and cigar box, but I could only assume and recite flavour descriptions like many sommeliers seem to do. How would I know what green bell peppers smell like, let alone a cigar box? It is possible that the wines I’ve had in the past might not have had any of the elements, therefore I didn’t get the smells. So I, having the textbook knowledge yet unable to fully incorporate it into my own life, had been annoyed for some time. Now finally, all the things about mercaptan, sulfites, aromas, oxidation, decanting,etc. start to come together in real sense. With Chateau Labegorce, I smelt a subtle aroma of bell pepper and could link it to the paprika paste I used to use in cooking. I couldn’t stop being amazed at the supple tannins and complex flavours that hinted the potential of ageing for further 10 years. the wine got more tannic and acidic and had a floral whizz. Then, what had happened to Chateau Mirebeau while everyone was showing favouritism towards Labegorce? The ignored and disappointed Mirebeau glass sat still concentrating toasty flavours while sending off the final whizz of fruity aroma before turning leathery; in shame and anger, perhaps. I found the mellow fruity and toasty flavour rather pleasant because I like toast. 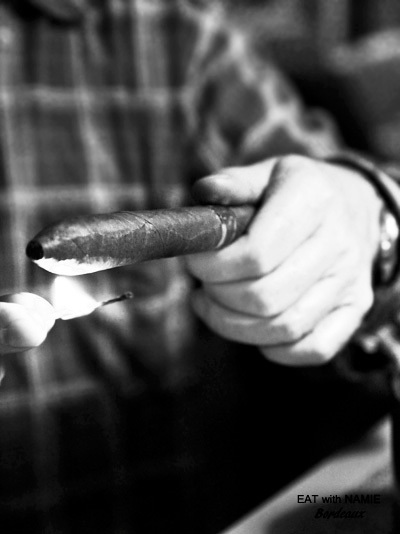 Sniffing at the Labegorce wine, I got really curious about the smell of a cigar box and cigars. And my mentor walked over to the glass cabinet and pulled out a full cigar box that had been kept, untouched for years since he stopped smoking. Wow, I was so excited to get my hands on authentic CUABA Habana cigars. The smell of the cut tip was nothing I had imagined; sweet spices, nutmeg, cinnamon, cedarwood, toffee, etc. All the aromas used in wine tasting were in that one roll of tobacco leaves after all. Then, I had a spicy chocolate taste on the tongue. So intrigued, I jumped at the chance and had my first puff of cigar on the balcony, listening to old French jazz. C’est vraiment la vie en rose! It was really interesting to detect the changes in wine flavours over time. Wine is truly a living thing that keeps evolving. Assuming the right time to open a bottle is kind of a gamble because you can miss its peak time or open it during its hibernation time. However, wine is wine after all, and even if we drink it with a bit of regret sometimes, if it’s a good wine, then it should be still enjoyable to drink no matter how young or old it is. I wish I could make a more comprehensive conclusion of the accidental experience in wine tasting, but this is all I have for now. If any of you readers can elaborate on my experiment and suggest good reads, it would be a great pleasure for me. Wine challenges and fascinates me every day….